Any abnormal increase in intraocular pressure during the first years of life will cause dilatation of the wall of the globe, and especially of the cornea. The result is a characteristic, abnormally large eye (buphthalmos) with a progressive increase in corneal diameter. This is also referred to as hydrophthalmos or hydrophthalmia. Epidemiology: Glaucomas in children occur once every 12000-18000 births and account for about 1 % of all glaucomas. Primary congenital glaucoma is an inherited autosomal recessive disorder. It is bilateral in approximately 70% of all cases; boys are affected in approximately 70% of all cases; and glaucoma manifests itself before the age of six months in approximately 70% of all cases. Today there is widespread public awareness of glaucoma in adults. Unfortunately, this does not yet apply to glaucoma in children. Etiology: (See also physiology and pathophysiology of aqueous humor circulation): The iris inserts anteriorly far in the trabecular meshwork (Fig. 10.2). Embryonic mesodermal tissue in the form of a thin transparent membrane (Barkan's membrane) covers the trabecular meshwork and impedes the flow of aqueous humor into the canal of Schlemm. Other abnormal ocular or systemic findings are lacking. ❖ Hydrophthalmia with ocular developmental anomalies. ❖ Hydrophthalmia with systemic disease. ❖ Secondary buphthalmos resulting from acquired eye disorders. Regardless of the cause of the increase in intraocular pressure, the objective signs and clinical symptoms ofchildhood forms ofglaucoma are identical and should be apparent to any examining physician. Symptoms: Classic signs include photophobia, epiphora, corneal opacification, and unilateral or bilateral enlargement of the cornea. These changes may be present from birth (in congenital glaucoma) or may develop shortly after birth or during the first few years of life. Children with this disorder are irritable, poor eaters, and rub their eyes often. The behavior of some children may lead one to suspect mental retardation. H Physicians should be alert to parents who boast about their child's "big beautiful eyes" and should measure intraocular pressure. It is essential to diagnose the disorder as early in the child's life as possible to minimize the risk of loss of or irreparable damage to the child's vision. Diagnostic considerations: These examinations may be performed without general anesthesia in many children. However, general anesthesia will occasionally be necessary to confirm the diagnosis especially in older children (Fig. 10.21). Fig. 10.21 Examination of a three-month-old infant with buphthalmos under general anesthesia. 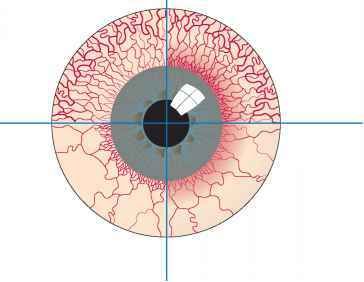 Findings include a corneal diameter of 14.0 mm (normal diameter is approximately 9.5 mm) and stromal opacification. Measurement of intraocular pressure. One should generally attempt to measure intraocular pressure by applanation tonometry (tonometry with a hand-held tonometer). H Measurement is facilitated by giving the hungry infant a bottle during the examination. Feeding distracts the baby, and a measurement usually can be obtained easily. Such a measurement is usually far more accurate than one obtained under general anesthesia as narcotics, especially barbiturates and halothane, reduce intraocular pressure. Optic disk ophthalmoscopy. The optic cup is a very sensitive indicator of intraocular pressure, particularly in the phase in which permanent visual field defects occurs. Asymmetry in the optic cup can be helpful in diagnosing the disorder and in follow-up. Special considerations: A glaucomatous optic cup in children may well be reversible. Often it will be significantly smaller within several hours of a successful trabeculotomy. Inspection of the cornea. The cornea will appear whitish and opacified due to epithelial edema. Breaks in Descemet's membrane can exacerbate an epithelial or stromal edema. These lesions, known as Haab's striae, will exhibit a typical horizontal or curvilinear configuration. The enlarged corneal diameter is a characteristic finding. 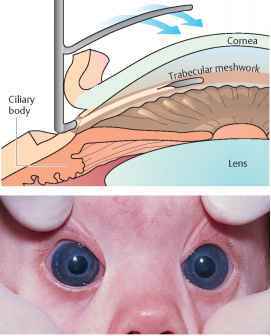 The cornea normally measures 9.5 mm on average in normal newborn infants. Enlargement to more than 10.5 mm suggests childhood glaucoma. Chronically elevated intraocular pressure in children under the age of three will lead to enlargement of the entire globe. Gonioscopy of the angle of the anterior chamber. Examination of the angle of the anterior chamber provides crucial etiologic information. The angle will not be fully differentiated. Embryonic tissue will be seen to occlude the trabecular meshwork. Differential diagnosis: Large eyes. A large corneal diameter can occur as a harmless anomaly (megalocornea). Corneal opacification. Diffuse corneal opacification with epithelial edema occurs in congenital hereditary endothelial dystrophy. Opacification without epithelial edema occurs in mucopolysaccharidosis (Hurler's syndrome, Scheie's syndrome, Morquio's syndrome, and Maroteaux-Lamy syndrome). Striae in Descemet's membrane. In contrast to the horizontal Haab's striae in congenital glaucoma, endothelial breaks can also occur as a result of injury during a forceps delivery (vertical striae), in keratoconus, and in deep ker-atitis. None of these differential diagnoses are accompanied by elevated intraocular pressure. Treatment: Childhood glaucomas are treated surgically. The prognosis improves the earlier surgery is performed. Principle and procedure of goniotomy. With a gonioscope in place on the eye, the goniotomy scalpel is advanced through the anterior chamber to the trabecular meshwork. The trabecular meshwork can now be incised as far the canal of Schlemm over an arc of about 120 degrees to permit drainage of the aqueous humor. Often two or three goniotomies at different locations are required to control intraocular pressure. These operations can only be performed when the cornea is clear enough to allow visualization of the structures of the anterior chamber. Principle and procedure of trabeculotomy. After a conjunctival flap and split-thickness scleral flap have been raised, access to the canal of Schlemm is gained through a radial incision, and the canal is probed with a trabeculo-tome. Then the trabeculotome is rotated into the anterior chamber (Fig. 10.22). This tears through the inner wall of the canal, the trabecular meshwork, and any embryonic tissue covering it to open a drainage route for the aqueous humor. A higher rate of success is attributed to trabeculotomy when performed as an initial procedure. 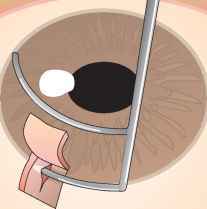 This operation can also be performed when the cornea is largely opacified. Prognosis: Goniotomies and trabeculotomies are not always successful. Even after apparently successful initial trabecular surgery, these children require a lifetime of follow-up examinations (initially several times a year and later once every year) as elevated intraocular pressure can recur, in which case repeat goniotomy or trabeculotomy is indicated. a A 12 o'clock incision is made to expose the canal of Schlemm, which is then probed with a trabeculotome. Then the trabeculotome is rotated into the anterior chamber, tearing through the embryonic tissue occluding the angle. The aqueous humor can now readily drain into the canal of Schlemm. b The surgeon can observe the rotation of the trabeculotome directly through a gonioscope placed on the eye during the operation. c Right and left eyes following successful trabeculotomy (photograph shows the same child as in Fig. 10.21). Both eyes exhibit a clear cornea (normal corneal light reflex) and normal intraocular pressure.